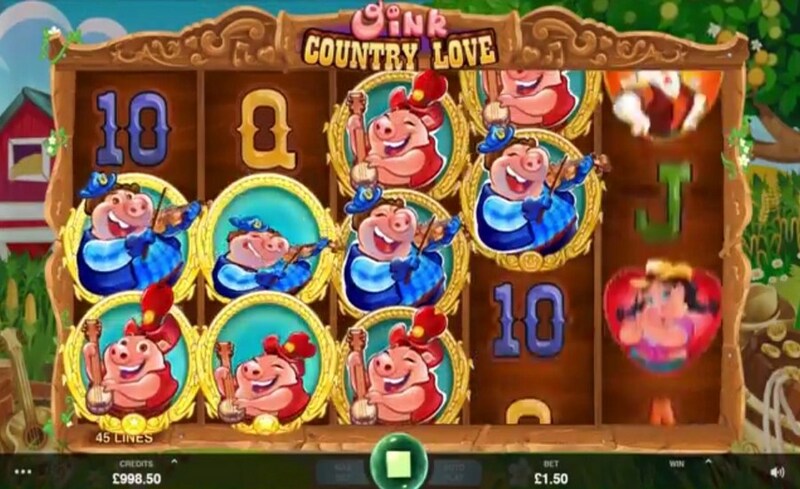 Get on your dungarees and join a piggy, hillbilly hoedown in slot machine game Oink Country Love. Powered by casino software provider Microgaming, this slice of Americana comes with a Barnyard Bash Free Spins feature where up to 160 free spins are on offer. Join the party from 50p to £125 per spin. 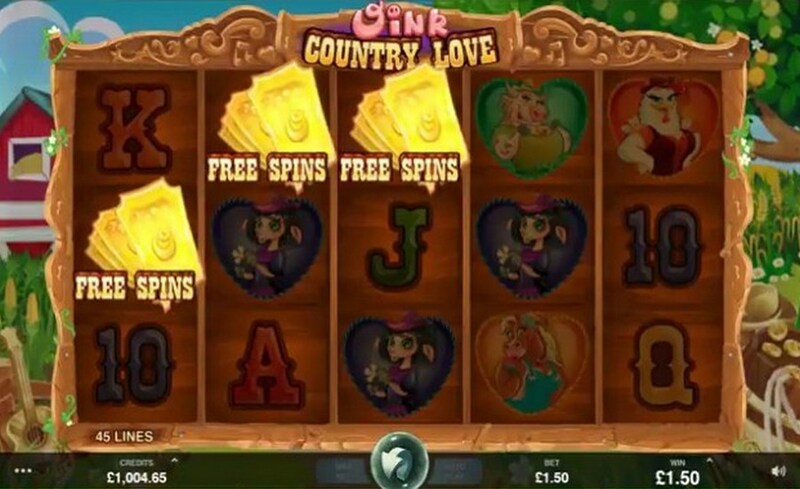 Oink Country Love slot isn’t the most serious slot machine game you’ll see. The reels set with a barn door and include wild west-style playing cards. 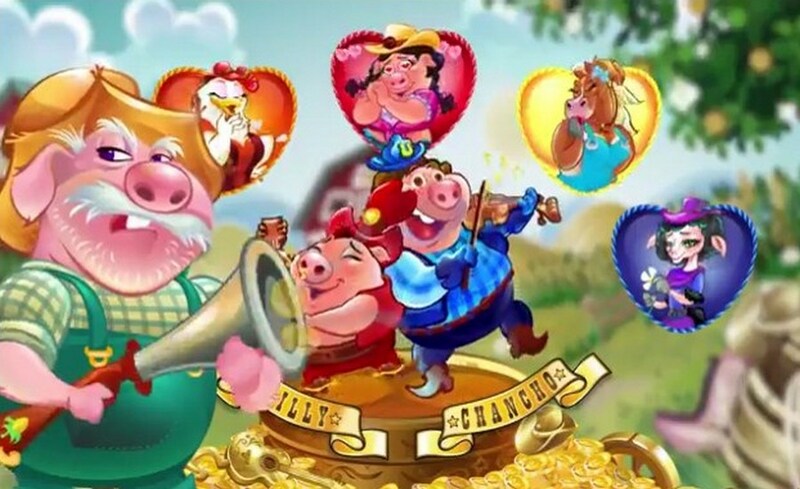 The stars of the show are Willy and Chancho, a pair of piggy musicians who play the fiddle and banjo. They’re trying to woo a pig who goes by the unlikely name of Miss Southern Charm. Willy and Chancho are both wilds, replacing everything bar the golden ticket which is the game’s wild. The scatter symbol is the key to opening up the game’s main feature – the Barnyard Bash Free Spins feature. Land scatters on 3, 4 or 5 reels on the same spin and you can look forward to 5, 10 or 20 free spins. The scatters symbols can land stacked on reels 2 and 3, offering a maximum of 7 scatters. That’s important as stacked scatters multiply the amount of free spins you can win. For example, land single scatters on reels 1, 4 and 5 plus 2 high scatters on reels 2 and 3 and you’d win 80 rather than the standard 20 spins. Re-triggers are possible here too. Expect to see more from Willy and Chancho during the feature too to further boost your winning chances. The theme here may be a bit manic but that’s not really the case with the variance. The volatility is in the low to medium range so you can expect plenty of smaller wins and lots of play for your money. The cartoon visuals are a nice match for the theme here, complete with a suitably twangy country and western backing track. No complaints there then. Oink Country Love is an entertaining game and one country show that’s well worth the admission.